Johannesburg (South Africa) – EFC AFRICA history was made at EFC AFRICA 11 on 10 November at Johannesburg’s Coca-Cola Dome when both lightweight and heavyweight champions retained their titles. First up, lightweight champion Costa Ioannou dominated a grappling-heavy bout with Alex Cheboub. Ioannou eventually managed to wear out ‘The Professor’ in round three and secure a rear naked choke, forcing Cheboub to tap out. Then, moments later in the heavyweight title bout, Ruan ‘Fangzz’ Potts caught Andrew ‘One Gear’ van Zyl in a fight-ending guillotine choke, also securing a submission victory. Now that Ioannou and Cheboub have secured their titles, new challengers await in 2012! Knockout of the Night went to Egypt’s Amr Wahman who took the fight to Leon Mynhardt late in the first round. Mynhardt’s early elbow strikes were paid back with interest in the form of a massive overhand right that took the legs out from under the ‘Iron Lion’. Submission of the Night went to Jadyson Costa for putting James Rennie away with a rear naked choke in round one. The slick Brazilian was untouchable as he transitioned through positions on the ground until Rennie gave him the gap he needed to sink in the choke. Fight of the Night went to Martin van Staden and Nolan Swanepoel for their incredible main card bout. Swanepoel seemed dominant on the ground but van Staden avoided danger until round two when he forced his way back to his feet. The fight took place all over the cage with both men pouring their hearts into the action but it was van Staden who eventually pulled off a lightning-quick feat of ferocious agility by landing a crushing knee to the face of Swanepoel. With Swanepoel clearly rocked, the referee stopped the action at 2:20 of the second round, signalling resounding cheers by thousands of spectators. Thanks to recently negotiated television broadcast deals, EFC AFRICA 11 went out to a host of countries including Zimbabwe, Malawi, Swaziland, Lesotho, Mauritius, Zambia, Nigeria, Namibia, Tanzania, Southern Sudan, Uganda, Kenya, Ireland, UK, Australia and Canada. From 2012, EFC AFRICA looks forward to being broadcast live on South African television. Main card bouts were also streamed live online at no charge and partnerships with MMA websites in USA, Greece and Germany saw EFC AFRICA win over legions of new fans and worldwide acclaim. Armand de Bruyn defeated Tez Makuebo via TKO at 1:28 in round one. Wesley Hawkey defeated Victor Anyaogu via TKO at 1:48 in round one. Don Madge defeated Wade Groth via TKO at 2:56 in round one. Amr Wahman defeated Leon Mynhardt via TKO at 4:10 in round one. Denzil Wait defeated Abdul Hassan via verbal submission at 2:12 in round one. Wentzel Nel defeated Terrence Griessel via unanimous decision after three rounds. Jadyson Costa defeated James Rennie via submission (rear naked choke) at 2:02 in round one. Donavin Hawkey defeated Yehia Deghidy via TKO at 4:19 in round one. Chett Meyer defeated Tumelo Maphutha via verbal submission at 4:00 into round two. Tyron Rightford defeated Jacques Joubert via TKO at 2:13 in round one. 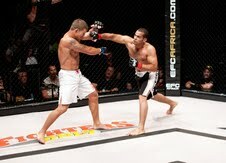 Martin van Staden defeated Nolan Swanepoel via TKO at 2:20 in round two. Costa Ioannou defeated Alex Cheboub via submission (rear naked choke) at 4:24 in round three. Ruan Potts defeated Andrew van Zyl via submission (guillotine) at 3:50 in round one. Headquartered in Johannesburg, South Africa, EFC AFRICA™ now produces 8 live Mixed Martial Arts (MMA) events annually, all hosted on the African continent. With over 70 athletes exclusively signed to the promotion from across the continent (from Angola, DRC, Nigeria, South Africa and more), EFC AFRICA is the biggest MMA promotion and showcases the toughest athletes on the continent. EFC AFRICA™ programming is broadcast across the African continent on FX, part of the Fox International Channels network. 2 back-to-back hour long episodes featuring bouts from past EFC AFRICA events air every Friday night on FX, which is available in South Africa on TopTV. In addition, delayed live and fight highlight episodes from the latest EFC AFRICA events are broadcast in 49 countries across Africa on e.tv, further infiltrating millions of homes across the continent and growing the EFC AFRICA brand. As well as the live internet broadcast on EFCAFRICA.com watched by viewers around the world, the events are also broadcast live to Nu Metro cinemas across South Africa giving thousands of additional MMA fans a larger than life event experience. EFC AFRICA™ also boasts a powerful international presence with bouts and promo videos from the latest events being covered heavily by local and top international MMA and mainstream sports, entertainment and news media. EFCAFRICA.com, the official website, receives unprecedented unique visitor numbers for an African sports organisation and EFC AFRICA also has a massive and rapidly growing Twitter and Facebook following, proving once again that EFC AFRICA is the fastest growing sports brand in Africa.